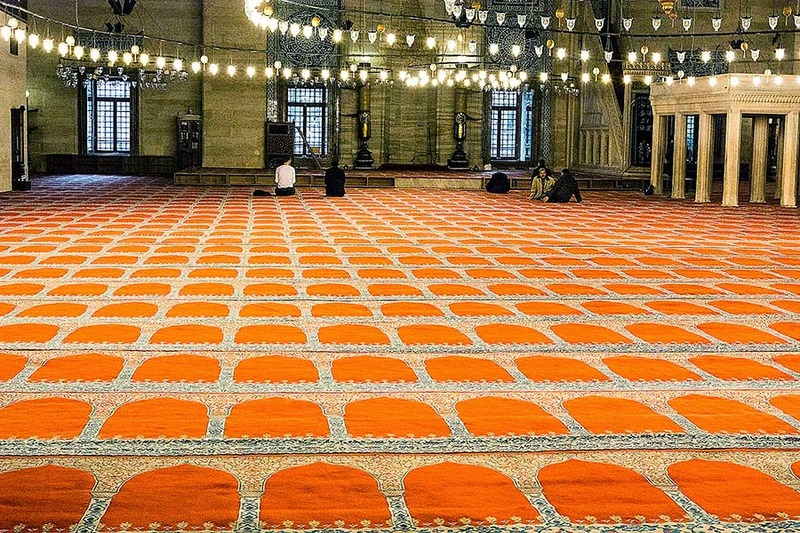 Süleymaniye Mosque is the largest in Istanbul and one of the must-see sights of Istanbul. The mosque has an amazingly large dome that creates a single vast space for a large number of worshipers. But the atmosphere is very soothing. The restrained decoration uses muted colours and blue and white Iznik tiles. The Ottomans were the first in Islamic architecture to use ceramic decoration on a monumental scale. 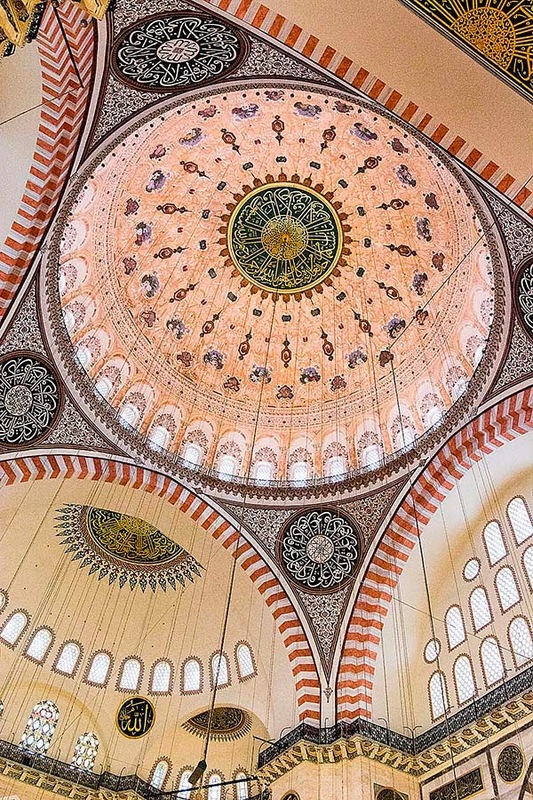 The Süleymaniye Mosque was built by supreme architect Mimar Sinan, who was influenced by Ayasofya. It blends Islamic and Byzantine architectural elements. The large dome is supported by half domes in Byzantine style as described in the Importance of Ayasofya. One new feature was to incorporate buttresses into the walls of the building. Note the patter of the prayer rug in the photo. That is to tell worshippers where to sit so that everyone is organized into neat rows. Be sure to walk around the courtyards and gardens. Here you will see men washing their feet and hands in the ablution taps. At the corners of the courtyard are four slender minarets, a number allowed only to mosques sponsored by a sultan. 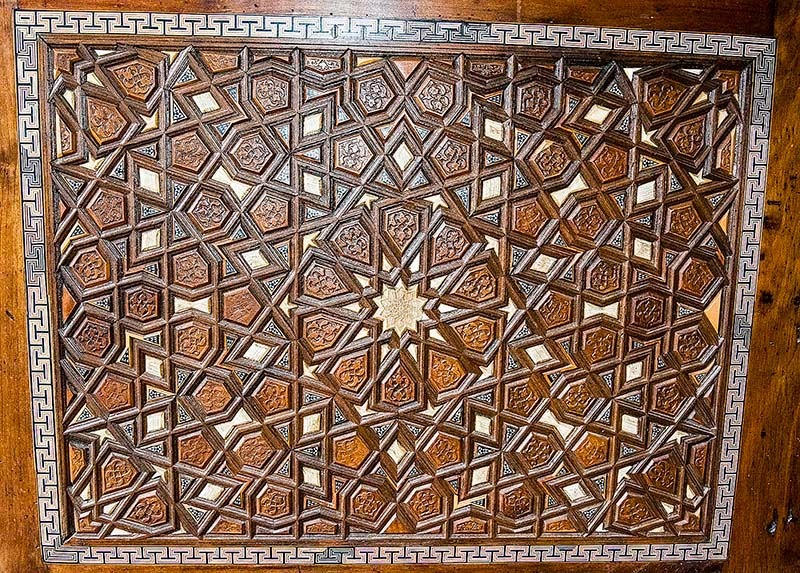 The beautiful and intricate geometrical wood-inlay patterns in the doors are spectacular. Sometimes they are inlaid with ivory or mother of pearl. The image on the right is just one panel of the door. The mosque was sponsored by the Ottoman emperor Sultan Süleiman, who saw himself as a second Solomon, his namesake. He is well-known in the west as Suleiman the Magnificent, perhaps because his reign (1520-1566) was the peak of the Ottoman Empire. Suleiman was influenced by Alexander the Great’s vision of building a world empire that would encompass the east and the west. This drove his military campaigns in Asia, Africa, and Europe. He expanded the Ottoman Empire from Hungary to Georgia and Algeria to Iraq. In the courtyard of Süleymaniye, we noticed a young man discussing the mosque with a group of Malaysian High school students on a ten-day trip in Turkey. The man was a Malaysian PhD student who is studying in Istanbul. He said he was the guide for these students that were sponsored to go to Turkey to learn about other cultures and religions. We all left the grounds heading toward the university. Outside the mosque on Süleymaniye Caddesi, we had that delicious sahlep drink – an orchid, vanilla or rose water, cinnamon, coconut, and milk drink – for only TRY 2. Maybe that's the student price? 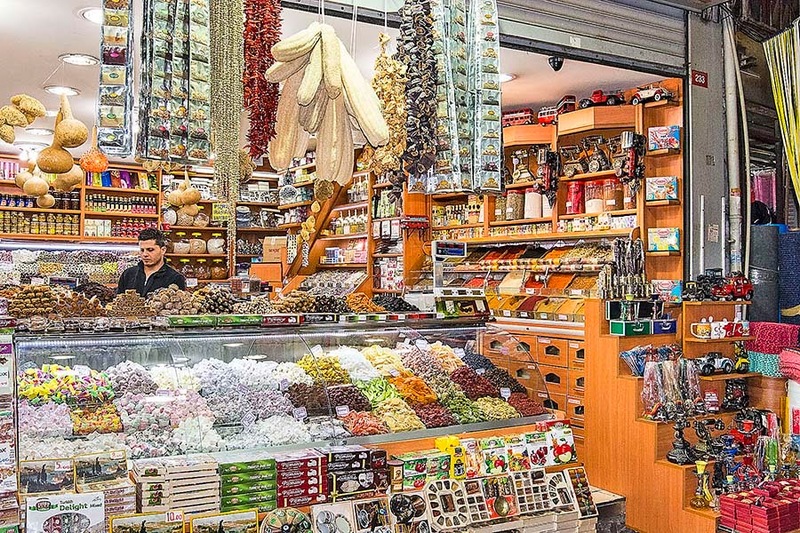 From there we walked down a steep street (Uzun Çarşı Caddesi, which means Long Bazaar Street) to the Spice Bazaar. But on the way we saw the real working class Istanbul, shopping and schlepping, including Roma gypsies begging. It was another world compared to Sultanahmet or Beyoğlu. Unlike Sultanahmet, there were no touts trying to get us to buy things – not even once. 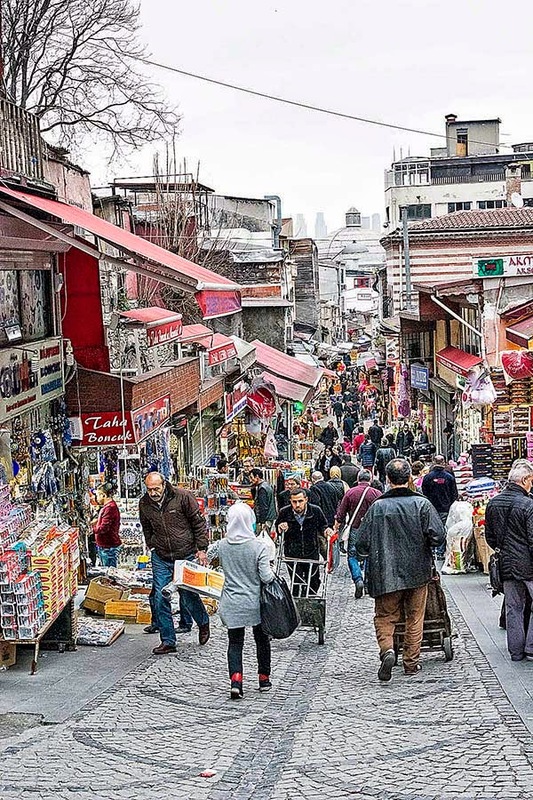 Turning right at the bottom of the hill was a long street (Hasircilar Caddesi) of shops with wall-to-wall people. There were all kinds of things for sale as well as spices. Suddenly the most aromatic coffee aroma wafted through the air. A man most have noticed my “coffee eyes” and gestured for me to get into the long line of customers. We are still sipping some of this delicious Kurukahveci Mehmet Efendi coffee (kahve) at home. Just a few metres further, Hasircilar led directly to the west entrance to the Spice Bazaar. Misir Çarşısı or Egyptian Market is the official name on your paper or Google map. Be sure to also walk on Çiçek Pazarı Sokak (which means Flower Market Street) just south outside of the covered market. The comparison of the streets and the covered market was like night and day. The market was far more upscale, higher prices and less people. The streets were frenetic, with porters carrying heavy loads and shoppers carrying heavy bags. So today marks the end of the Istanbul segment of the trip. Tomorrow we get the car and drive to Asia – I mean Bursa. Next Post: Green Tomb will blow you away!